We have come to the end of the season of Epiphany. The day of Transfiguration is at hand. In the Synoptic Gospels, Jesus takes three of his disciples, Peter, James, and John on a journey to the mountain top. As they arrive on the mountain, Jesus is transfigured (metamorphized), his countenance changes, and his clothes become a dazzling white, “such as no one on earth could bleach them,” revealing the glory of God present in him. Then, Moses the Lawgiver and Elijah the prophet gather with Jesus on the mountain-top. Jesus engages in conversation with these two paradigmatic figures from the Hebrew Scriptures. While the nature of the conversation is not revealed, I’m sure it wasn’t idle gossip. Whatever the nature of their conversation, it is interrupted by another voice that emerges from a cloud that suddenly appears around them. The voice declares of Jesus: “This is my Son, the Beloved, listen to him” (Ml. 9:2-8). Standing alongside Peter, James, and John, how might we perceive the meaning of this event? They seem not to understand. Do we? The reading from the Hebrew Bible for Transfiguration Sunday is taken from 2 Kings 2. It features Elijah, a central character in the Transfiguration story, as well as Elisha, Elijah’s protégé. In the course of the story, Elijah will hand off his prophetic ministry to Elisha. Taken in the context of the Transfiguration story, this reading from 2 Kings helps create a backstory for Elijah’s appearance. In this story, Elijah and Elisha journey from Gilgal to the Jordan. They will stop twice along the way. Once at Bethel and once at Jericho, before arriving at the Jordan. We are told in verse 1 that Elijah is about to be taken up into heaven in a whirlwind. At both Bethel and Jericho, Elijah instructs Elisha to remain at the site, and at each stop a company of prophets will step forth and inform Elisha that his master will be taken from him. He responds that he knows and that they should be silent. Elisha’s word to Elijah is that he will not leave him, as long as both Yahweh and Elijah are alive. So, they journey on, and as they do so, Elisha is further empowered, and perhaps is even transfigured during the journey. When they reach the Jordan, with a company of prophets watching, Elijah takes his coat (mantle) and hits the water with it. As he does this, the water is parted so that the that the two may journey beyond the Jordan on dry land. This act of parting waters links Elijah to Moses and Joshua. Moses used his staff to part the sea, so that Israel could pass from Egypt into the Wilderness of Sinai. Joshua will step into the Jordan with priests carrying the Ark of the Covenant, and the river will part so that Israel can pass into the Promised Land (Joshua 3). The crossing of the Jordan parallels what happens here, only that in this case Elijah journeys to the other side of the river and enters a new Promised Land. As they cross the river, Elijah turns to his apprentice, knowing that his time of departure is at hand. He asks Elisha: “what do you want from me?” Elisha makes a bold request. He asks for a double portion of Elijah’s spirit. 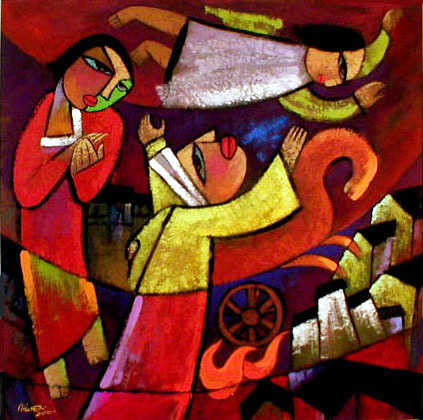 While this is bold and difficult, Elijah responds: “if you see me as I am being taken from you, it will be granted you.” As the story continues, a chariot of fire appears, separating the two men, and as Elisha watched Elijah was taken up into the heavens in a whirlwind. The key here is that Elisha keeps focused on his master, as he had promised. He had asked for a double portion. He will have it in the form of grief and in his ongoing prophetic ministry. When Elisha could no longer see his master, in his grief, he tore his clothes into two pieces. Now that the master is gone, he is alone in his grief. Even though he grieves, the prophetic calling remains viable. Elijah may have been drawn into the heavens, but he leaves behind the mantle which he used to strike the waters of the Jordan, so they could pass to the other side. Whatever this double portion of Elijah’s spirit might be, Elisha now must continue on without the presence of the master. The task of prophetic ministry now belongs to him alone. he also has a mantle to take up. He made a bold request. He now has that double portion. He must continue the ministry. So, Elisha takes the mantle of Elijah, and like his master, he strikes the waters. The river parts, he walks across, and begins a new ministry on the other side of the Jordan. He has made his own river crossing. As we stand on the mountain of transfiguration, watching along with Peter, James, and John, the conversation of Jesus with Moses and Elijah, and hear the voice of God commend Jesus, might we not hear a call to take up the mantle and continue the ministry. Joshua took up the mantle of Moses. Elisha took up the mantle of Elijah. Peter, James, and John will take up the mantle of Jesus, a mantle passed on generation to generation through the ages. God will not be without a voice. Picture Attribution: He, Qi. Elijah is taken up to Heaven, from Art in the Christian Tradition, a project of the Vanderbilt Divinity Library, Nashville, TN. http://diglib.library.vanderbilt.edu/act-imagelink.pl?RC=46088 [retrieved February 5, 2018]. Original source: heqigallery.com.